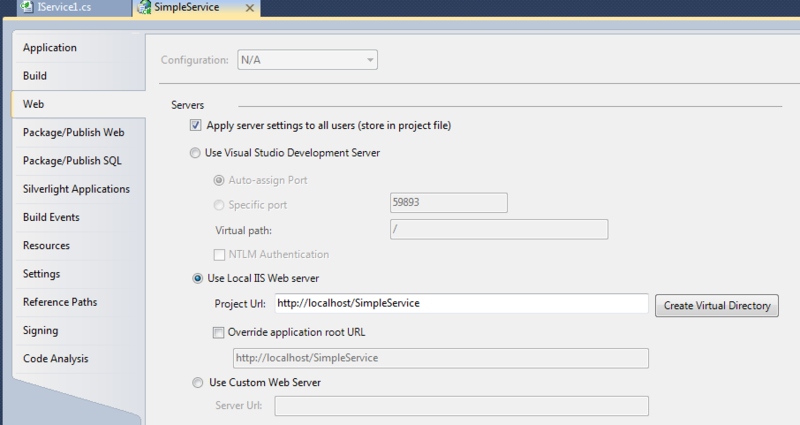 Note I: I’ve created this service in a new solution in an instance of Visual Studio 2010 running as administrator. I did this because I wanted to run the service in IIS so that it can be accessed from multiple computers (so that the iphone/simulator on my Mac can access it). 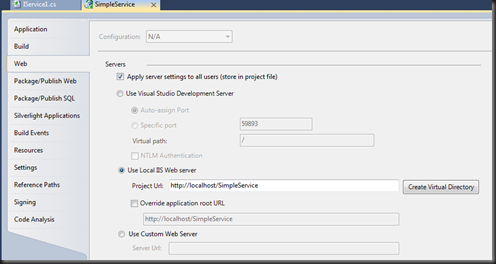 See the following image to configure the service to run on IIS. 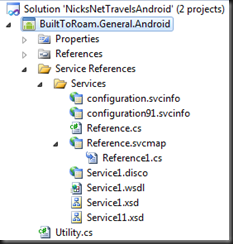 Note II: Because I’m running this service in IIS 7 with .NET 4 there is almost no configuration for this service in the web.config file. What this does mean is that because I’m publishing this service over HTTP the default binding is the basicHttpBinding. As with Silverlight and the .NET Compact Framework, there is only support for basicHttpBinding (or the webHttpBinding if you want to roll your own web requests). Adding this service to your Windows Phone 7 application is unbelievably simple. However, to make it slightly more complex we’re going to add the service into our shared library. This way we can have our service logic in a common place across all three platforms. - Enter the address of the wcf service (eg http://localhost/SimpleService/Service1.svc” and hit Go. This should return the service information. Give it a namespace (eg Services) and click OK. This will generate a folder called Service References, a number of files that contain the proxy classes for the referenced service and a ServiceReferences.ClientConfig file, which includes endpoint configuration information about the service. - Add the following code to the MainPage.xaml.cs code behind file. Put a breakpoint on the last line of the above code and run the application. What you should notice is that the application will fail throwing an exception. This is because we haven’t told the application the endpoint or binding to use for the service request. Normally this would be specified in the ServiceReferences.ClientConfig file which would be automatically added to the application when adding the service reference. However in this case because we added the service reference to a class library we need to make sure we include the ClientConfig file in the application. - Right-Click the WP7 application project node (ie BuiltToRoam) and select Add >Existing Item. 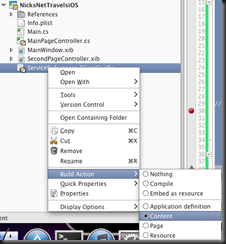 Navigate to the shared library (ie BuiltToRoam.General) and select the ServiceReferences.ClientConfig file. Do NOT click the centre of the Add button. Instead click the down arrow on the right side of the Add button. Then select Add as Link. Note: This is important because if we update the service reference in the future we don’t want to have to remember to update additional copies of this file. - F5 to build and run – this should run smoothly (if not, make sure IIS and the service application are running smoothly). From the iOS application to call our wcf service we can reuse the proxy classes that we just generated. - Right-click on the shared library (BuiltToRoam.General.iOS) and select Add > Add Files. 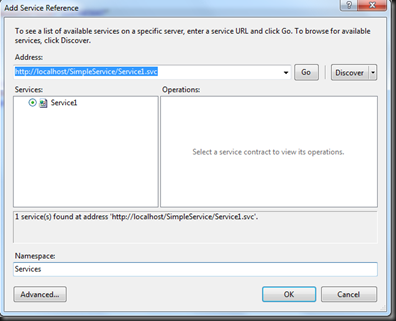 Select all the files in the Service References\Services folder and click Open. This will add the proxy files to the project with the appropriate build actions. - Check that the shared library builds – I had to add a reference to the System.ServiceModel assembly at this point (right-click References and select Edit References; from the Packages tab select System.ServiceModel and click OK). You will probably want to add this assembly and System.Xml.Linq to the References for the iOS Application project too. 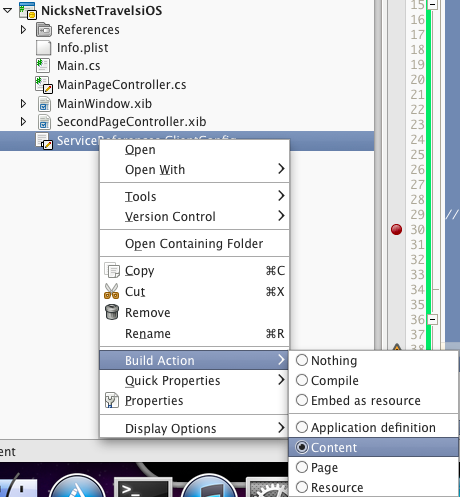 - You need to set the Build Action of the ServiceReferences file you’ve just linked to Content. Do this by right-clicking the file and setting the Build Action directly in the context menu. - Now, all you need to do is write some code to read the configuration file, setup the proxy client and call the service. To make use of the same wcf proxy classes we generated earlier we need to a) add the appropriate files to the shared library and b) add the service configuration to the Android application project. - The first step is relatively straight forward: In Solution Explorer select the shared project (BuiltToRoam.General.Android) and toggle the Show All Files button in the toolbar of the Solution Explorer window, so that files that aren’t currently part of the project are shown. - Right-click on the Service References folder and select Include in Project. You can now toggle Show All Files to hide the excluded files again. You should end up with a structure in the shared library similar to the following. To break this down the Post-Build event commands will get run after this project has been built. In this case we’re copying the ServiceReferences file from the shared library project directory to the Resources\Raw sub-folder of the Android application project directory. 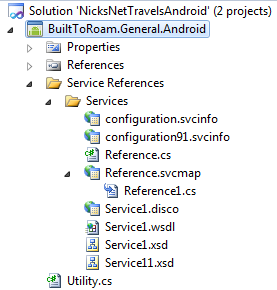 - Build the solution, and then toggle the Show All Files option for the Android application project. This should reveal the ServiceReferences.ClientConfig file within the Raw directory. If an error is thrown during the build to do with the xcopy command, you may have either got the path wrong (source or destination), or the Raw folder may not exist, in which case you need to create it. This has included this file as a raw resource that can be accessed from within the Android application. Now in the body of Activity1 we’ll need to open this resource, read out the wcf service configuration which we can use when creating the instance of the proxy. We could have just created the EndpointAddress in code but that would mean that we’ve got it hard coded within the application. By reading the contents of the ServiceReferences file we’re at least keeping the wcf service configuration information in a single file for all three platforms. 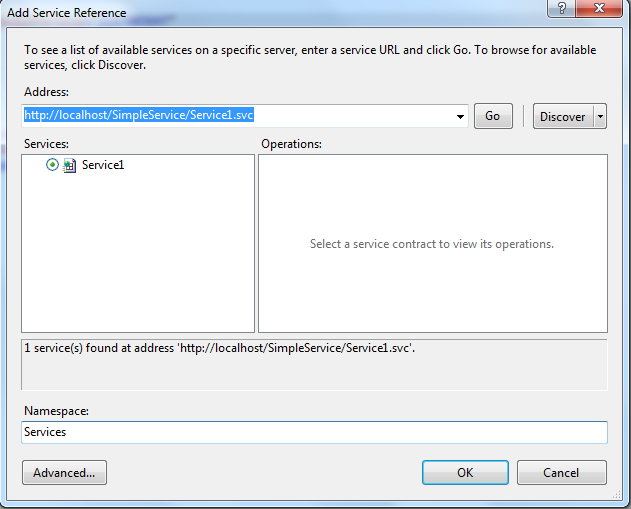 - Set a breakpoint in the client_GetDataCompleted method to see the result returned from the service.